This affordable DT-40 series is perfect for your first venture into datalogging. Review maximums and a detailed playback of your run in this small easy-to-use instrument. Engine RPM (Tachometer) and up to two temperatures. Maximum readings of all functions. Full half hour of datalogging and detailed playback. All functions record 10 times per second. Times displayed to the 10th of a second. Automatic power on and off feature. 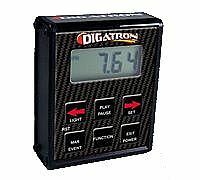 Instrument Dimensions are 3.625"X 3.5"X 1.2"
Quality lightweight high impact aluminum casing. Quickest and most reliable sensors on the market.